After the first Friday event was rained out we are ready to take two for the first Friday Night show of 2019. This Friday Night, April 12, Snydersville will highlight the first ever Invert Night for all points classes to stir up the racing action (details can be found below). On top of that, both the Briggs Stock Heavy and Sr. Clone will be going for a cool $200 to win in 20 Lap Showdowns. 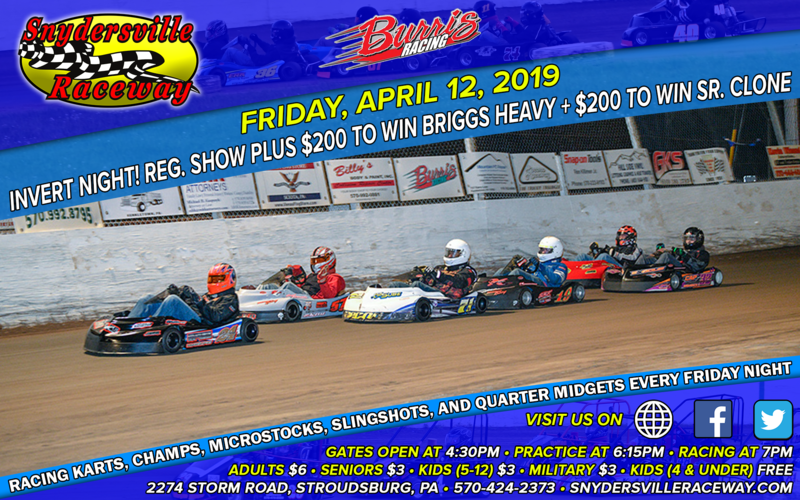 Plus our 2019 Championship Points will receive the Green Flag as All Classes of Karts, Champs, Microstocks, and Slingshots will begin battling for the coveted Division Championships and Overall Championships. Come on out this Friday everyone and join us for some Exciting Racing Action on the 1/8 mile Bullring “Where It’s Dirt Racing at Its Best!” Sign-In will now open 4:30pm and go till 6:30pm for Pill Draw, Drivers Meeting will be at 5:55pm, Practice will begin 6:15pm, and Racing is slated to start at 7pm! Invert Night Details: This is the first of 4 Invert Nights planned in 2019. How this will work is everyone will draw normally for Heat starting spots and lineup from lowest to highest pill draw. After the heat(s) are completed for a class, the winner of the heat (or heat 1) will draw an invert pill which will invert the top “x” cars in the feature lineup. The invert pills will 0 (or no invert), 3, 6, or 9 (pending class entry count).